Left-of-centre governments in Latin America are currently under attack, and both the USA and the international media are at the forefront of the campaign. 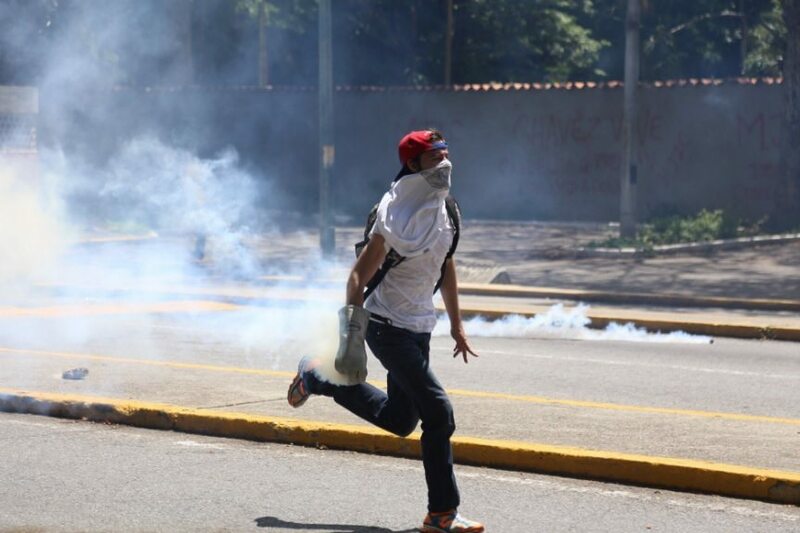 Here’s the story of how this battle is playing out in Venezuela. Washington may have accepted that its decades-long embargo on Cuba has failed, and taken steps towards normalising relations as a result. It may also have allowed peace talks (brokered in Cuba) to resolve Colombia’s civil war, after over five decades of fighting. But these steps towards reconciliation in Latin America don’t mean that the USA has suddenly stopped trying to interfere – as it has done via the CIA for many decades – in a region it considers to be its backyard. In fact, 2016 has so far seen numerous signs that there is a renewed offensive underway. Perhaps nowhere is this clearer than in Venezuela. There is unrest in today’s Venezuela, largely because of the economic difficulties caused by a global fall in oil prices since 2014, but also because of increasing political polarisation (encouraged by the USA and its affluent local allies). Hundreds of citizens have recently hit the streets to call for a national vote of no confidence in President Nicolás Maduro, and the opposition-controlled National Assembly has tried its best to push this process forward. The leaders of the opposition are generally white, wealthy, men on the far-right of the political spectrum. There has also been an increasing trend of politically-motivated murders targeting pro-government activists. But there has also been support for the left-of-centre government. Tens of thousands have rallied around Maduro, including many of Venezuela’s indigenous groups. Nonetheless, TeleSur insists that the government has been following all the constitutional procedures related to recall referendums (a concept introduced by Maduro’s predecessor, Hugo Chávez). The Venezuela Solidarity Campaign summarises the referendum process here, which it says is being seriously misrepresented in the international media. Venezuela’s National Electoral Council also says there has been no delay, and that the signature validation currently taking place is a “clearly established process”. At the moment, many citizens are having serious difficulties finding and paying for many basic food items and other everyday products. But whether these problems are down to economic mismanagement or economic war depends very much on who you speak to. For many citizens, one serious problem is the fact that a number of people have been hoarding products and selling them on at much higher prices, a crime for which some have already been arrested. And this is not an issue that can be blamed on the government. At the same time, the most recent international statistics suggest that food security in Venezuela is not a severe issue. TeleSur even insists that food security is “still far better” than it was before the current government came to power. Also, Maduro’s increase of the country’s minimum wage by 30% on 1 May may well help to alleviate the situation to a certain extent. the same gleeful pessimism is never on display in response to capitalism’s massive catastrophes. When Hugo Chávez won the 1998 presidential elections in Venezuela, he set about using the country’s vast oil revenues to reduce poverty and build a much stronger system of social welfare. This experience soon inspired similar victories of moderate left-wing governments throughout Latin America, which would be referred to collectively as the Pink Tide. Chávez immediately introduced a progressive new constitution, which guaranteed citizens’ “right to demonstrate, peacefully and without weapons” (which were “criminalized and heavily repressed” under previous governments, according to TeleSur). His government soon completed an impressive list of achievements, including the halving of poverty levels, the eradication of illiteracy, and the creation of a national system guaranteeing free health care for all citizens – to give just a few key examples. Capitalism was not replaced by socialism. But there were big worries for local and international elites, such as the government’s insistence on national control over natural resources. Companies like ExxonMobil – the biggest oil corporation in the world – would lose international attempts to challenge these actions. As early as 2001, a figure from one of Venezuela’s wealthiest families benefited from funds coming from the U.S. National Endowment for Democracy (NED) and the International Republican Institute (IRI) – politically-motivated NGOs whose main aim was to stop the Chávez reforms in their tracks. Henrique Capriles, who has recently been accused of inciting violence by calling for the Venezuelan military to rebel against Maduro’s government, is still a key opposition figure today. In 2002, there was a US-backed coup that temporarily saw Chávez overthrown, and other coup attempts were foiled in following years. Suspicions of US involvement were justified by the fact that the US ambassador in 2002 had been a military attaché in Chile during the US-backed coup of 1973, and by the appearance of US military helicopters in Caracas during the coup. In 2006, WikiLeaks revealed that American organisations like USAID and OTI were “playing central roles in a strategy to oust Chavez”. Between 2004 and 2006, USAID had spent around $15m on funding right-wing anti-government groups. As recently as 2011 and 2015, the USA has imposed a number of sanctions on Venezuela – calling it an “extraordinary threat” to the United States. Now, amid the most recent economic problems, the Organization of American States (OAS) has taken a lead role in provoking continued unrest in Venezuela. The Secretary General of the OAS, Luis Almagro, has called Maduro a “traitor to his own people”, and the Venezuelan president has responded by calling Almagro a CIA agent. The OAS leader, whose apparent bias has been criticised by other OAS members, has organised an “urgent session” in Washington between 10 and 20 June. Here, he hopes to encourage Venezuela’s suspension on the basis of supposed constitutional violations. This action comes after a request from opposition leaders from the Democratic Unity Roundtable (MUD), which is the biggest grouping in Venezuela’s National Assembly. Based in Washington, the OAS receives most of its funds from the USA, and has been accused of serving the foreign policy interests of the international superpower. Like the OAS, the European Parliament (EP) also seems to have focused more on provocation than negotiations, calling for the “restoration of democracy” in Venezuela in a recent resolution. This in spite of the fact that the country’s opposition made unprecedented gains in democratic elections just months ago. Unlike the OAS and the EP, the Union of South American Nations (UNASUR) is pursuing a path in Venezuela focused on peaceful dialogue and reconciliation. Opposition leaders and the Maduro government are currently involved in UNASUR-sponsored talks facilitated by former world leaders. The big problem is that Maduro’s US-backed opponents seem more intent on overthrowing the democratically-elected Maduro than on resolving Venezuela’s current political problems. On 6 May, representatives from the MUD were criticised for failing to turn up to peace talks. The world’s media and political elites will likely continue to issue judgement on Venezuela while providing little objective analysis. And although politics is rarely black and white, there are two key questions that we should ask when considering what’s going on in Venezuela today. What is the best way to ensure peace – national dialogue or international intervention? And which forces are set to benefit the most from the current unrest – the government and its supporters, or their opponents? – Read The Canary‘s previous article on Venezuela. – Question everything you hear in the corporate media. Did the West fake an entire attack on al-Qaeda for an oil pipeline?